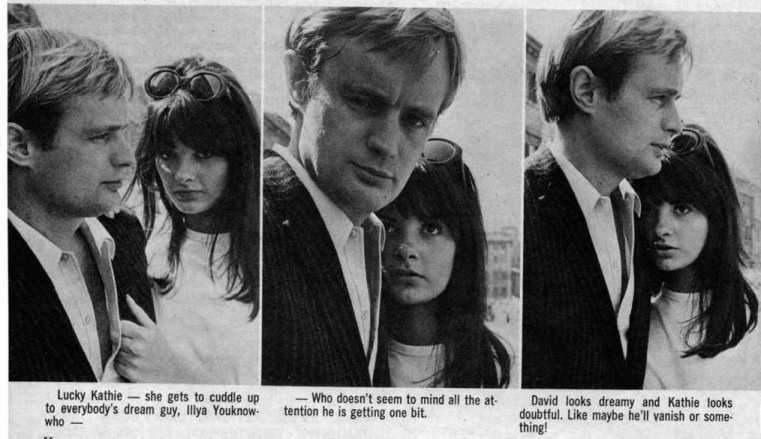 DAVID MCCALLUM, the handsome heartbreaker from U.N.C.L.E. has re-entered the bachelor sweepstakes again after his recent amicable separation from Jill Ireland. David has certainly proved himself to be a man of A.C.T.I.O.N, for he has already been seen hither, thither and yon (like from Europe to the Sunset Strip) with a lovely American model named Kathie Carpenter. Kathie, whom David met casually almost a year ago when he was doing a photo layout for a slick fashion mag, is a 21-year-old New Yorker. She--well, like who wouldn't?--dug David from the first moment she met him. But she kept this to herself, for he was very much the married man at the time. By coincidence, many months later Kathie went to Rome at exactly the same time that David was there filming Three Bites of the Apple. In no time, they ran into each other and soon were running around together (this happened after Jill announced that she and David were separating). When David returned to California, he invited Kathie to come out and let him have the pleasure of showing her around The City of The Angels-- Los Angeles. As things stand now, David is definitely not going steady, but he does admit to liking Kathie very much. So, like they say, anything can happen now!